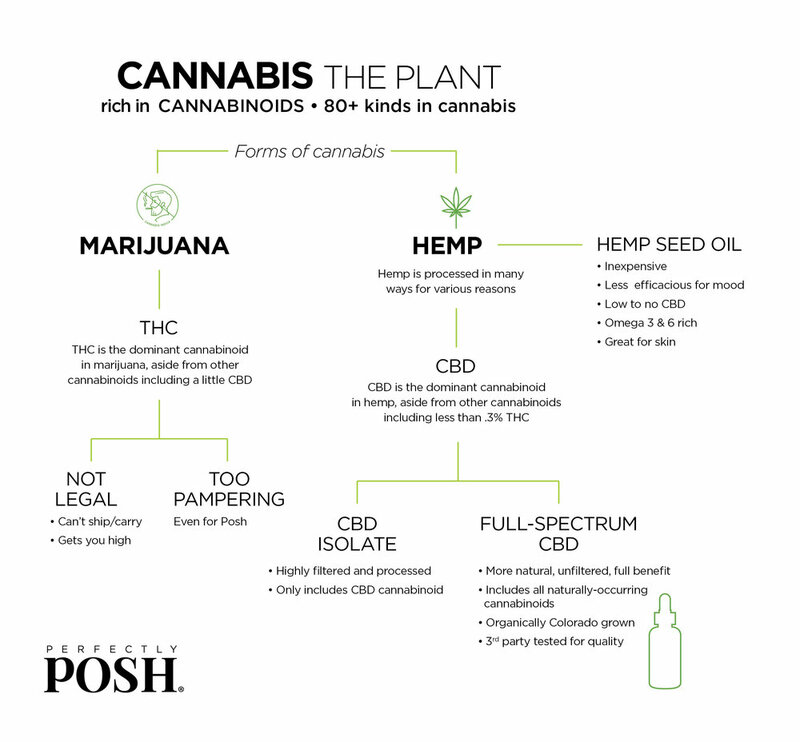 CBD is derived from the hemp plant. Industrial hemp, to be specific. And no, it won’t get you high. CBD is non-psychoactive and has a remarkably safe profile. Per the 2014 Farm Bill, CBD products made with industrial hemp cannot contain more that .3% THC (the active chemical in marijuana) and most contain amounts so low they cannot be detected in laboratory testing. Chemically, CBD oil is one of 80+ compounds known as cannabinoids and goes by many names in the beauty and pampering industry. You may hear it referred to as CBD-rich hemp oil, hemp-derived CBD oil, CBD-rich cannabis oil, cannabis sativa seed oil, or hemp extract. Due to the passing of the 2014 Farm Act, hemp and its components became more widely studied and shipped, leading to a better understanding of its many benefits. In order to get the maximum benefit from your product, you need to use FULL-SPECTRUM hemp oil. Full-spectrum oil isn’t filtered to remove other cannabinoid molecules from the oil. Because it contains all of the ingredients mother nature created it with, it’s more pampering and efficacious. If you’re looking for a natural product that improves skins appearance and calms both body and mind, CBD may be the ingredient you’re looking for. You can find CBD oil in Cann I Be™ More Pampered CBD Oil Drops blended with peppermint for a chill addition to all your favorite Posh. If you find this formula isn’t potent enough for you, Cann I Be™ So Extra CBD Oil Drops contain 1,000 mg of CBD, offering more chill per drop. Add either to your favorite products and elevate your Posh to next-level pampering! Interested in viewing our Certificates of Analysis? Cann I Be™ More Pampered CBD Oil Drops: Click here. Cann I Be™ So Extra CBD Oil Drops: Click here.